The French football players' union (UNFP) has called for synthetic grass pitches to be replaced by natural grass ones "from the start of next season," citing injury concerns. It comes three days after Lille and Morocco's Sofiane Boufal injured his knee on Lorient's synthetic pitch. The injury has left the 22-year-old requiring surgery. The UNFP said playing on synthetic surfaces "leads to muscular pain, twists, stress on joints and burns". Lorient have already announced plans to install a new grass pitch in the summer with the French League set to outlaw synthetic playing surfaces in France's top two divisions by 2018. However, Nancy president Jacques Rousselot said the club would continue to play on synthetic turf for the 2016-17 season after clinching their return to the top flight. Boufal will miss Lille's final two league games against Guingamp and Saint-Etienne. He has been influential for Lille this season, scoring 11 goals and providing five assists to help them to sixth in the league. The France-born midfielder has been involved in nearly half of the goals of the northern club in 29 appearances in the league this season. At international level he made his debut for Morocco in their Africa Cup of Nations qualifier away to Cape Verde in March after pledging his future to the North African country. 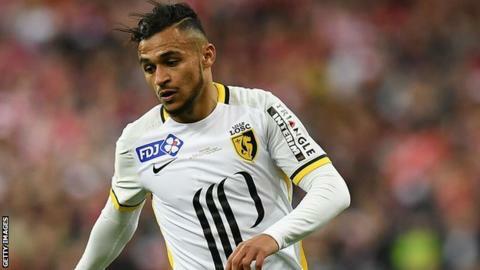 Boufal provided an assist in the reverse fixture as Morocco beat Cape Verde 2-0 at home on 29 March to seal their place at the 2017 tournament in Gabon.